It’s no surprise what most students want. Everything, free. They want the government to supply them with everything To redistribute wealth for their benefit. Which is to say, they want socialism. Socialism has caused the economic collapse of European states, yet about half the voters in America, to judge by current polls, want to emulate them. The global trend toward a resurgence in public demand for socialism in response to a worsening crisis is a certainty. How could it be otherwise when for decades now the schooling of children has been delegated to functionaries of the state? – Which is the main reason why there should be no state-provided, state-run education. There in one sentence are a bundle of beliefs and values that Ayn Rand rightly loathed and despised. They pave the road to ruin. 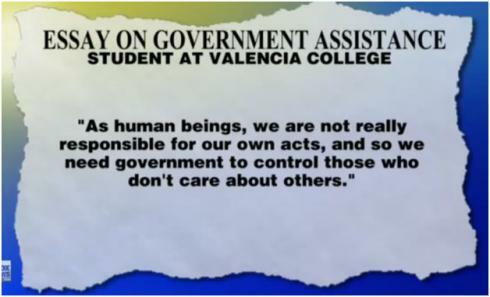 The writer of those words was a member of a Valencia University economics class. The professor, Jack Chambless, asked the class to write an essay on what the American dream means to them, and what they want the federal government to do to help them achieve that dream. Out of 180 students participating, only about 10% wanted the government to leave them alone and not tax them too much, but a whopping 80% wanted the government to provide pretty much the whole dream thing wrapped in a tidy bow – including free college tuition and health care, jobs, even the down payment on their future homes, money for retirement and hard cash, taken in the form of taxes from rich people. And that is Obama’s economic policy. Professor Stephen Prothero is a professor of religion at Boston University. As one might expect of a professor of religion, he makes unwarrantable assumptions. He does so in a column he’s written for USA Today titled You can’t reconcile Ayn Rand and Jesus. The Tea Party, he assumes. The Tea Party protests against the Obama government’s economic policies of redistribution, deficit spending on ever-increasing entitlements, the robbing of “the rich” and the enforced dependency of “the poor”, resulting in high unemployment and a load of debt on future generations. Ayn Rand would be sympathetic to such protest. Some Tea Partiers carry signs quoting her. So – Professor Prothero reasons – the Tea Party is inspired by her philosophy. For what Jesus? We surmise that everyone who thinks about Jesus, whether or not he’s a Christian, has his own Jesus in his head. Stephen Prothero’s Jesus is a lefty. He quotes the biblical Jesus as saying: “Blessed are the poor”. Lefties have reason to bless the poor every day of their lives, and hope they never go away (ie become rich), for in the name of that imaginary caste lefties pursue their egalitarian cause, believing the pursuit to be so ennobling that they can be as nasty as they choose to real people without losing a drop of their moral pride. Professor Prothero will remember that the biblical Jesus is reported as saying not only “Blessed are the poor” (Luke 6:20), but “Blessed are the poor in spirit” (Matthew 5:6), which lefties plainly are not. In Rand’s Manichaean world, it is not God vs. Satan, but individualism vs. collectivism. Right. And we too see the great political divide as being between individualism and collectivism. While Jesus says, “Blessed are the poor,” she sings Hosannas to the rich. The heroes of Atlas Shrugged (which, alas, is only slightly shorter than the Bible) are captains of industry such as John Galt. The villains are the “looters” and “moochers” — people who by hook (guilt) or by crook (government coercion) steal from the hard-won earnings of others. Turning the tables on traditional Christian morality, Rand argues that altruism is immoral and selfishness is good. Our argument is that selfishness is essential to our survival, though it doesn’t preclude generosity or even altruism (which is very rarely practiced). See our post Against God and Socialism, April 29, 2011. Moreover, there isn’t a problem in the world that laissez-faire capitalism can’t solve if left alone to perform its miracles. Of course there are problems that cannot be solved, but individuals left free to innovate profitably can and do solve a lot of them. Collectives cannot and do not. The solutions that capitalism facilitates are not claimed to be miracles. Miracles happen only in the minds of the religious and the gullible. Ayn Rand was as much against religion as we are. “Faith, as such, is extremely detrimental to human life,” Prothero quotes her as saying, without comment. To him her words are shocking, and he expects them to shock his readers. We, however, agree with her. Our pages provide ample evidence that religion has always done and continues to do immense harm. I first read Atlas Shrugged and her other popular novel, The Fountainhead, while festival-hopping in Spain after graduating from college, so I can attest to the appeal of this philosophy to late adolescents of a certain gender. “A certain gender”? What gender would that be? And why only that one? He doesn’t say. As an adult, however, Rand’s work reads to me like a vulgar rationalization for greed lying on top of a perverse myth of the right relationship between individual and community. Now we don’t recognize the sin of greed, but we do recognize the sin of envy. Socialism – or “redistributionism” – is the politics of envy. That’s his message to Tea Partiers who display Rand quotations, and to Republicans, who also, he assumes, are guilty of trying to reconcile Ayn Rand and Jesus. We are delighted, and not at all surprised, to hear that Paul Ryan learnt from Ayn Rand. If we had nothing else to be grateful to Ayn Rand for, her getting Paul Ryan “involved in public service” would put us hugely in her debt. His capitalist convictions and economic know-how is already doing good for the Republican Party, and would do good for America (and therefore to the world) if he were to become president. We see him as the desperately needed leader under whom the United States of America would again embody the great idea of individual freedom on which it was founded.